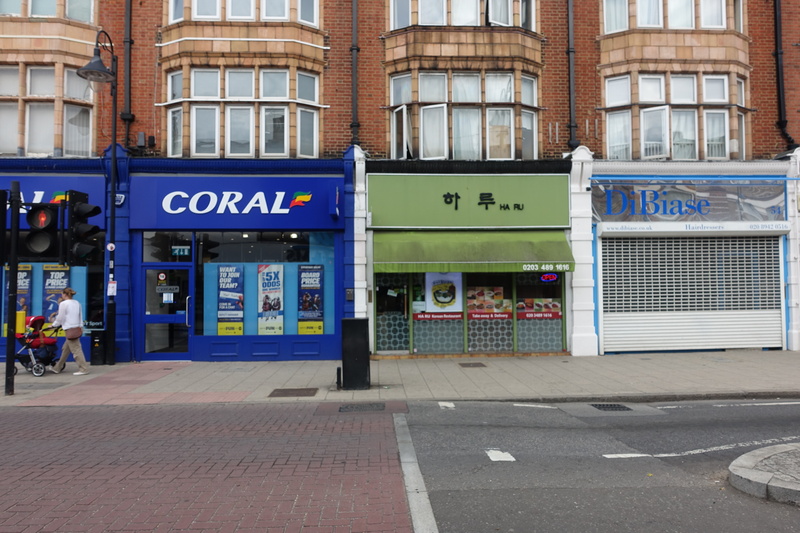 I’m off the “eaten track” again and decided to venture South of the river to Korea Town in New Malden to a neighbourhood gem called ‘Ha Ru’ . 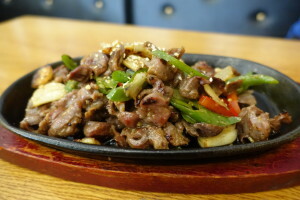 I’ve been informed that it’s been trading for around 5 years and specialises in popular Korean dishes such as Bibimbap, Gimbap, stews, noodles dishes, hot pots and a variety of grilled proteins. It seats about 22 people in the main restaurant, about 4-6 along a bar adjoined the left side of the dining area as you walk in. There are lego brick style wooden tables that can be either split into 2 or joined together to cater for larger groups too. There are a further 4 tables available at the back of the restaurant, in a low slung bum to the floor format with only cushioned mats as seating vs chairs. Remember to take your shoes off in there though as your wrists will be duly slapped otherwise! The walls in this room are covered in marker pen doodles, general messages and signatures which I thought was a quirky touch. 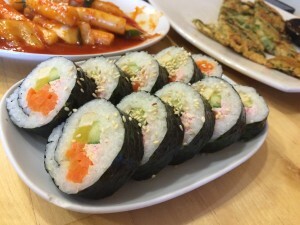 The atmosphere is casual, with not a single table cloth in sight; you’re treated to soft Korean pop playing subtly from the wall speakers and you’re rubbing shoulders with local Korean folk which is a good sign. 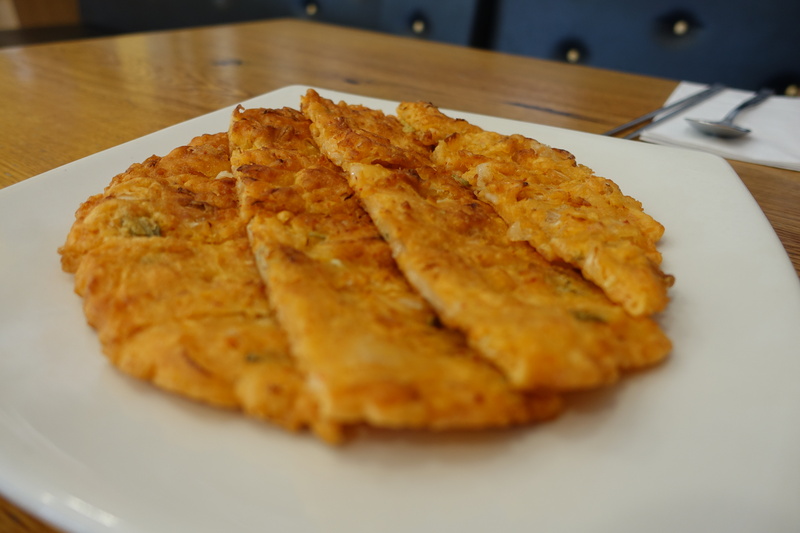 First up we have wheat flour pancakes with kimchi £5.90. It came with the perfect amount of batter that makes friends with kimchi, then its pan fried to a crisp golden colour. It tasted really good when dipped into the umami soy chilli sauce it came with. 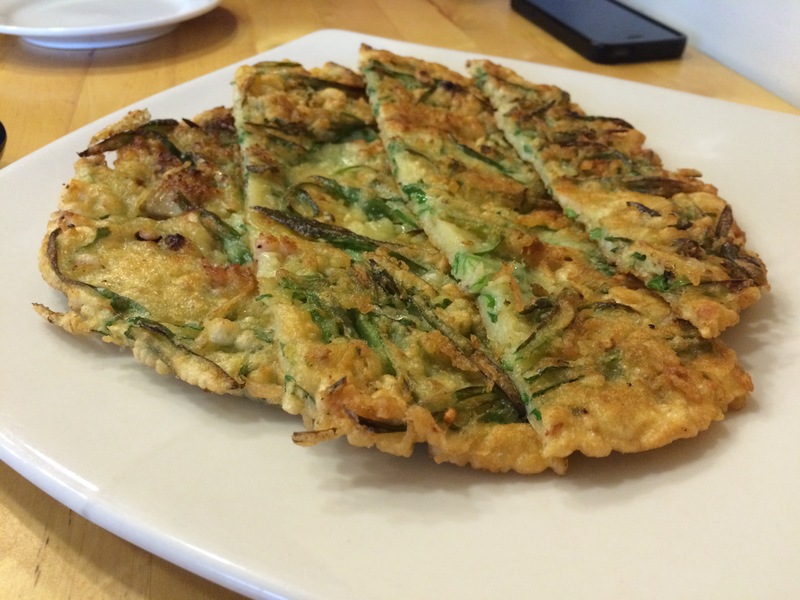 Next up were the wheat flour pancakes with spring onions and chives. £6.50. 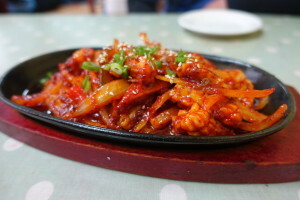 Just like the kimchi one’s they were crispy delicious and came with baby mussels and squid. You’ll also get the same dipping sauce as above. Here we have haru ddukbhokkie £5. (Chewy rice sticks and vegetables). 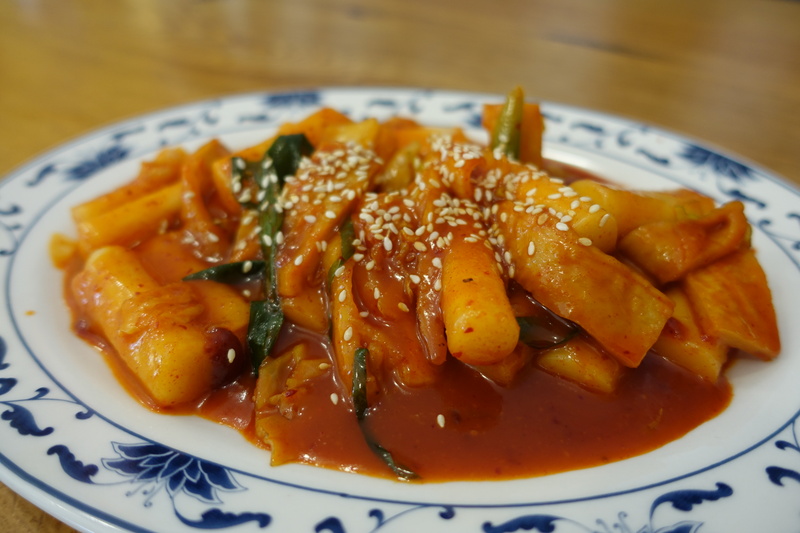 They have the texture of wine gums and are cooked in gochujung giving them a nice little savoury-sweet chilli kick. The vegetables were cabbage, spring onion and came with some Korean fish cakes thrown in for good measure. Delicious. Gimbab. £3. A must have and quite possibly a guilty pleasure for me – why may you ask? It contains cucumber, carrot match sticks, egg, takuan (pickled daikon) and crab. Well ok crab flavoured sticks which is the guilty bit but who cares when something taste so good. 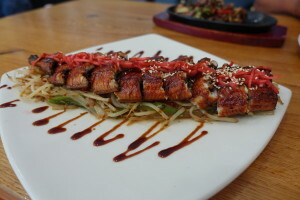 I love the way that they gloss the nori with sesame oil and sprinkle toasted sesame seeds on top! Ojinguh Bbokum £11. This was the spicy squid cooked in gochujang, onions and peppers on a sizzling plate. 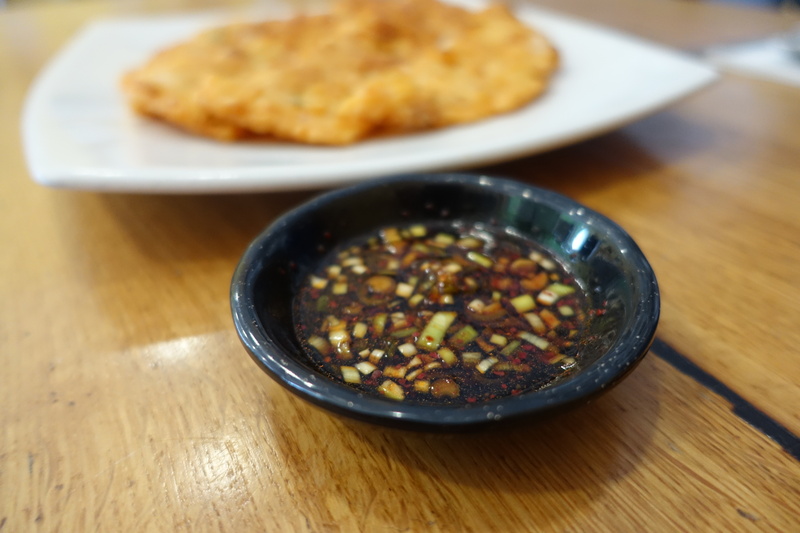 You get a hot, sweet, savoury taste just like the rice sticks but came with a very mild curry flavour – they were a joy to eat and were full of spicy persuasion! Daktongjip £11. This one is for the advanced eater and not for the faint of heart – they are actually chicken giblets sliced very thinly, stir fried placed on an sizzling plate with thick slices of garlic, peppers and onions. There’s no prior slow cooking so the texture was crunchy but the flavours were incredible and were real treat to eat. Last but not least we have Janguhkui £21. 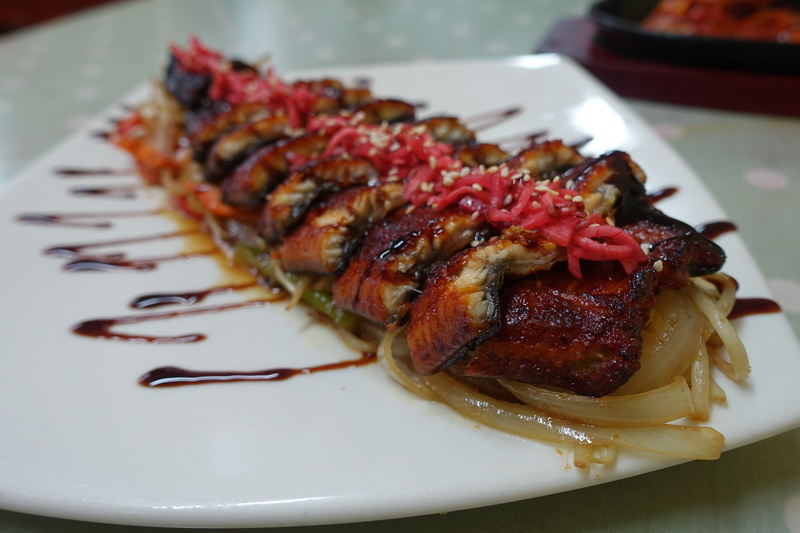 (Grilled eel). 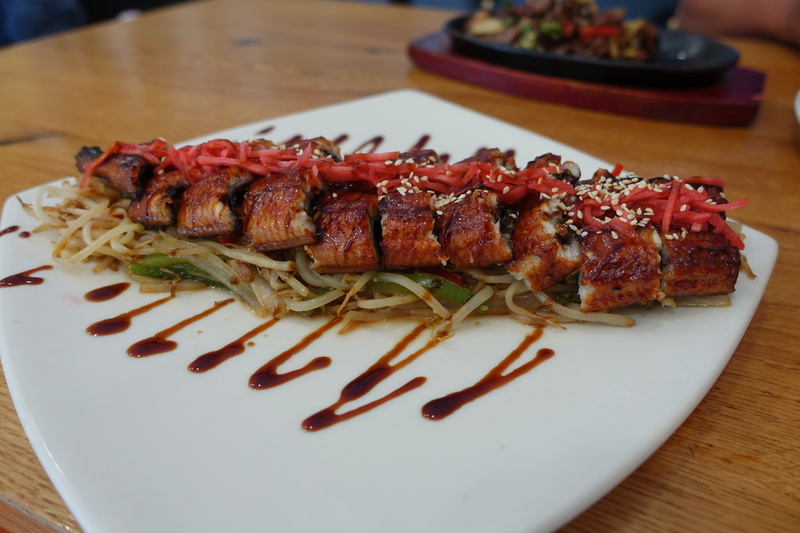 For me this dish is a must when you visit, you get the fantastic richness of the eel combined with sticky-sweet teriyaki sauce and the crunch/lightness of the vegetables (carrots, peppers, beansprouts & onions) really balances each mouthful. The pickled ginger on top adds freshness. 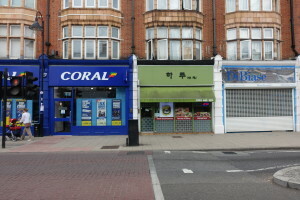 The good: The people of New Malden are lucky to get have this on their door step – it’s a great place to go for good value Korean food with fast/friendly service. Check it out for some bang-for-your-buck eating pleasure. The bad: The kharzi’s are adjoined to the back of the restaurant which is almost shed like – not the most pleasant so remember to go before you eat!